Blizzard and Korea love their games. 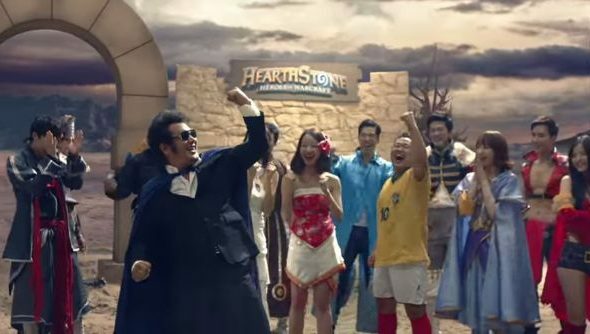 Forged from this undying love is a video advertisement for Blizzard’s online CCG: Hearthstone: Heroes of Warcraft. It’s rather mad. Trying to explain it would be as difficult as trying to explain the concept of Valve Time, so it’s probably best you just watch it for yourself. 00:05 The original king of games, revolutionary fun creation! 00:08 In this dark era of no justice! The legend of legend, Blizzard’s HEARTHSTONE! 00:16 The tears that you shed from complicated games! 00:20 Unstoppable storm of girlfriend’s phone calls~! 00:24 And the dark knight that I faced tonight in the PC Cafe! 00:27 Wrathful mother’s angry face! 00:31 The disowning from family tree isn’t far! 00:33 But now, play it short! Enjoy! 00:38 Easy and (의리의리) attraction! HEARTHSTONE!!! 00:50 Soulless weapons are NO MORE! WE DON’T USE WEAPONS! THROW AWAY ALL YOUR WEAPONS! 00:58 Hello? Let oppa play this one game really quickly! 01:03 Justice doesn’t make your loved girl wait! 1:14 Don’t look at just me anymore, LOOK AT ME?? 1:19 Girls? Girls? hahaha, Girls WILL ENJOY TOO, HAHAHAHAHHAA! 1:38 START OUT SIMPLE, GET ADDICTED LIKE CRAZY! Need a hand in building your Hearthstone decks? You should probably check out ourbest Hearthstone decks for beginners.